Further coverage: BBC Radio Wales, BBC Radio Cymru and BBC Local Radio. 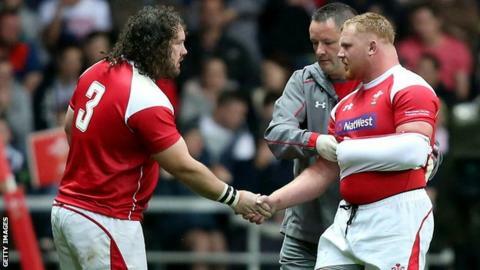 Wales should consider adding Adam Jones to their World Cup squad because of their injury concerns in the front row, says former Wales wing Adrian Hadley. Props Samson Lee, Paul James and Aaron Jarvis all suffered injury problems in Sunday's opening 54-9 win over Uruguay. Hadley says tight-head Jones should be enticed out of retirement if Wales need cover, with England next on Saturday. "They could always bring Adam Jones back. Who knows? He might get a phone call," said Hadley, capped 27 times. "If Samson Lee is out then we need a tight-head in there and the only one we've got [in the squad] is Tomas Francis, so why wouldn't you call Adam? "I think he'd go for it, and if Samson Lee is out, I can't see any reason why they wouldn't." British and Irish Lions prop Jones, 34, called time on his 100-cap Wales career in January 2015 after being left out of his country's Six Nations squad, but is considered to be one of the finest tight-heads of his generation. Lee and James have calf problems and Jarvis has a rib injury, while full-back Liam Williams has a thigh knock and centre Cory Allen has been ruled out of the tournament with a hamstring strain. Head coach Warren Gatland has already said he may have to call up front-row cover, while Tyler Morgan was added to the squad on Monday after Allen's scan confirmed his tournament was over. Morgan missed Newport Gwent Dragons' Pro12 win over Zebre on 11 September because of illness. Should Gatland resist the calls to approach Jones, his other front-row replacement options include Ospreys' Nicky Smith and Rob Evans of Scarlets - both loose-heads - and Cardiff Blues tight-head Scott Andrews. All three players missed selection for Wales' final 31-man World Cup squad, while Scarlets tight-head Rhodri Jones is not fit after rupturing a pectoral muscle at a training camp in July. "We've got a big problem with the props," added Hadley. "They're going to have to bring someone in, without a shadow of a doubt, but obviously we'll have to see how Paul James and Samson Lee are. "A couple of the boys - Scott Andrews and Rob Evans - were left out anyway, so you could bring them in. "I think Liam Williams will come through and without him we'd have no full-back cover at all." If any further injuries bite in the backs, Gatland could turn to Gloucester's James Hook or Rhys Patchell, as both players can cover at centre as well as full-back and fly-half. Patchell's Blues team-mate Gareth Anscombe is another option, but the New Zealand-born player is currently sidelined with an ankle injury.